Composing for orchestra and choir is always a fulfilling challenge and inspiration. Being on a quest for the most mysterious phenomenon in life and music makes it even more exciting. Austrian composer Johnny Bertl and I are again uniting our skills in finalising a new orchestral suite. 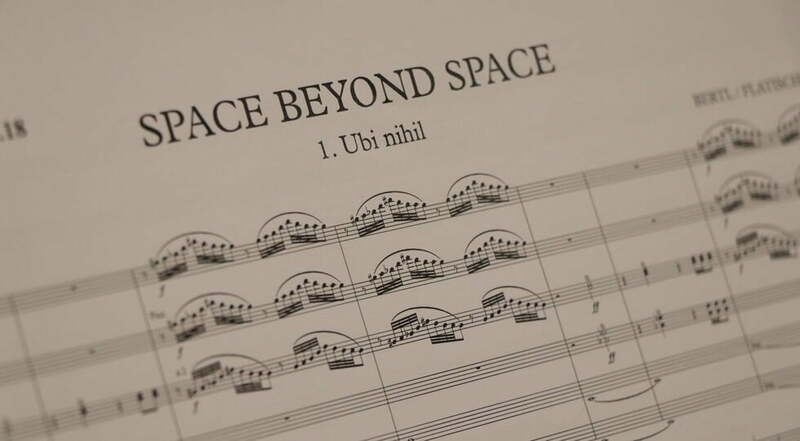 „Space beyond Space“ will celebrate its world premiere on July 26th 2018 in Auckland Town Hall. This work has taken us on an incredible journey. Space! How would one present space in a composition that involves two hundred and thirty musicians plus a full setup of drums? When I found the title „Space beyond Space“, I felt excited but also clueless of how to start such a composition. I had to surrender to the state of not knowing and rely solely on my intuition. This process showed soon that this composition needs a „story” and with that profound lyrics. From Johnny´s and my roots, Latin clearly turned out to be the obvious choice for this task. However, there are no traditional texts dedicated to the phenomenon of space. With that we were challenged to create our own philosophy about space. Dr. Smolak, one of the best philologists available today, translated our lyrics into Latin. „Spatium omnia tu – omnia nosti omnia saecula.“ translates into “Space! You, who knows everything throughout all ages.” followed by „Spatium omnia iungis – omnia iungis – omnia omnibus.“ which translates into “Space! You, who connects everything with everything.” With that, the first complete polyrhythmic composition for choir was created. On my recent TaKeTiNa world tour I had the chance to meet and rehearse with the choir that will be singing „Space beyond Space“ in July: the Auckland Choral Society – the most renowned choir in the southern hemisphere, dating back to 1855. Three days in Auckland full of creative action with conductor Uwe Grodd and the different sections of the choir left everyone excited and inspired. Space indeed is the most mysterious and fascinating phenomenon that we know of. Space has stimulated the curiosity of mankind from the very beginning. The most advanced scientists as well as ancient philosophers and whole spiritual traditions have been researching the phenomenon of space ever since. Newest science assumes that space is both – extremely full and unimaginably tense – while through the vector equilibrium of the forces present it appears completely empty. This is as incomprehensible as the famous heart sutra that states: „space is form, form is space“. Just as a Zen-Koan this is completely inaccessible for the logic mind and therefore has the power to transport someone who recites it into a meta logical reality. Composing „Space beyond Space“ I am constantly reminded to pause, to breathe, to surrender to the void that space provides. Intuition arises out of this place naturally, and composing becomes a holistic experience. „Space beyond Space“ is part of the „Beethoven and beyond“ project that will also perform Beethoven´s Mass in C. Together with Auckland Philharmonia and Auckland Choral under conductor Uwe Grodd there will be a whole drum setup onstage played by Grammy Nominee Tupac Mantilla and myself. Now it´s time to finish the last bars before we fly down to New Zealand.